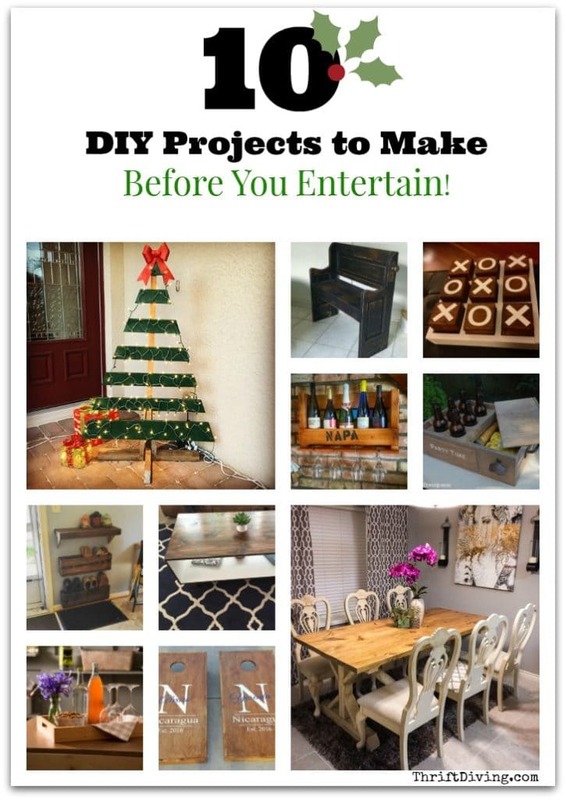 You are here: Home / DIY Tutorials / 10 DIY Projects to Make Before Entertaining! Thrift Diving and RYOBI teamed up to bring you this awesome post! All opinions belong to Thrift Diving. You know how life is: try to arrange a get-together at your house and everybody has a reason why their schedules just never converge. But the holidays are different, though. Folks, we’ve just entered the phenomenon called “Everybody-And-Their-Mama-Will-Be-Stopping-By” which occurs between November 1st and December 31st. LOL. Not only does it mean you’ll feel compelled to clean up the nasty mess from the guest bathroom because the men in the house have poor aim (please tell me this isn’t just my house). But you’ll want to be practical when having guests over (e.g. How will you entertain them? Where will they sit? What will you do will all those extra shoes by the door?). And not to mention, you’ll want to show off a little bit. Everyone wants to be proud of their home when people come over! And you’re no exception. So, I teamed up with my partners at RYOBI Power Tools to select 10 DIY projects that you need to get started on right now before your friends and family start beating down your door this holiday season! GIVEAWAY: Keep reading to find out how to win $300 in RYOBI Tools! Enter daily between Nov. 1 – Nov. 30th! 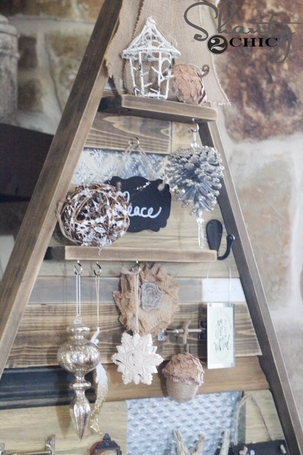 MUST MAKE #1 – A Pallet Christmas Tree! Come on, you know you love pallets, too. I’ll admit they’re played out because everyone is doing everything with pallets. (And there’s nothing I like least than following trends). But sometimes you come across a project that is really so cool and easy, how could you not try it?? That’s how I feel about pallet Christmas trees! I had found this one on RYOBI Nation (click here to join for free), and what I really loved about it is how simple it was. I started fantasizing about having a bunch of these on my porch, but I like the idea of white ones, with white lights! Wouldn’t it be nice to greet guests with something pretty that makes them smile? 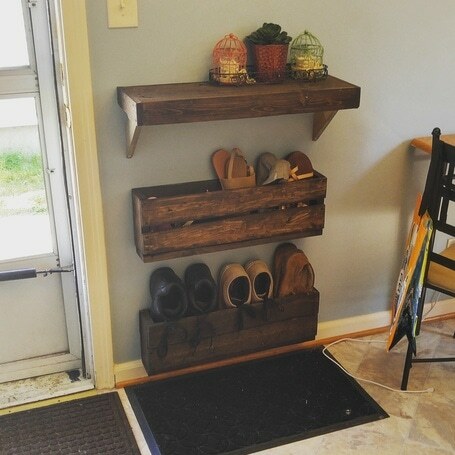 To create this, you can use pallets or even regular common boards from the lumber section of The Home Depot. Any cutting tool can be used to make it, such as the jigsaw, circular saw, or the miter saw. You’ll need some outdoor screws that won’t rust, too. Project found HERE on RYOBI Nation. 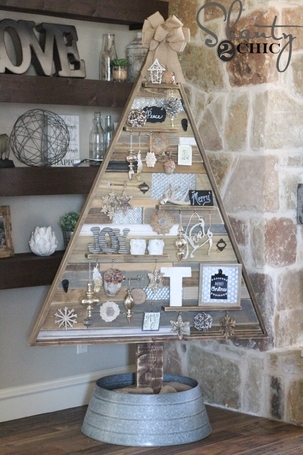 Even more creative is this pallet Christmas tree that has memories and keepsakes hung on it! The idea is the same, except there aren’t any gaps between the boards, and instead of lights, you can decorate it with all kinds of ornaments and family heirlooms! Don’t you love the little shelves?!?! Amazing creativity here, for sure! 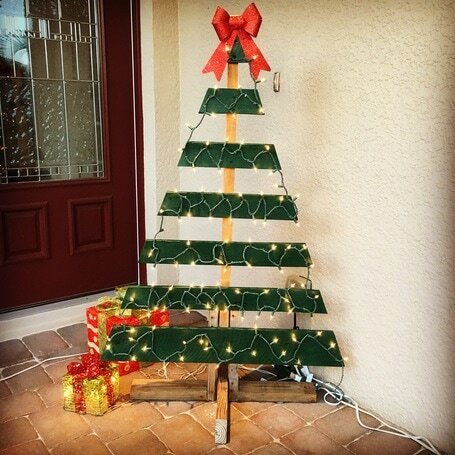 You can find the tutorial on how to make this pallet Christmas tree HERE. 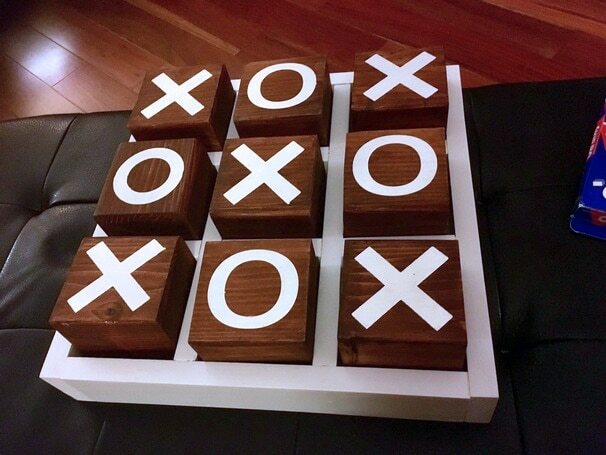 Must-Make #2 – DIY Tic-Tac-Toe! I think I’m dying a little with this project! The most fun times that I’ve had at get-togethers have always centered on board games! (Remember the game Taboo? Oh, man…now that is the ultimate board game for parties!). But one of the most simple and fun games are things like Tic Tac Toe. I love how each of the wooden blocks fits nicely in its square. To make this, you’d need a circular saw or a miter saw (since the blocks look thick; a jigsaw won’t cut through that size). It’s just a simple box shape with wooden dividers. Pretty easy, actually, for the beginner. To create the Xs and Os, you can buy a stencil or make one. 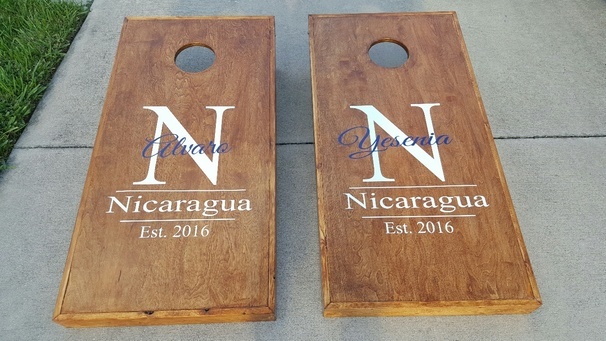 You can find this project HERE on RYOBI Nation. You can also find the entire tutorial for the Tic Tac Toe on Her Tool Belt blog. A few months ago I found it on RYOBI Nation. What I loved the most was the door handle on the side; it’s a great place for guests to hang their purse. 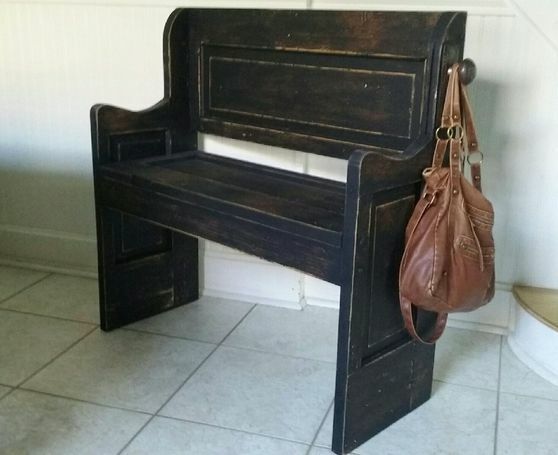 You can find out more info about DIY upcycled door bench HERE. Once again, another pallet project! This project is good if you generally don’t have (or won’t have) a ton of extra shoes at your door. You could probably double up the width by using an extra pallet. It just depends on your space and if you will have enough room. I haven’t started working on my foyer yet, but when I do, I’m stealing this project idea! See extra pictures of this project here on RYOBI Nation. If people aren’t gathering in the kitchen, they’re likely going to be gathering around a coffee table, right? If you’ve been thinking of upgrading your coffee table, you might want to consider something like this. What caught my eye was the rich, glossy stained wood on top, but also the fresh white on the inside. Love this! 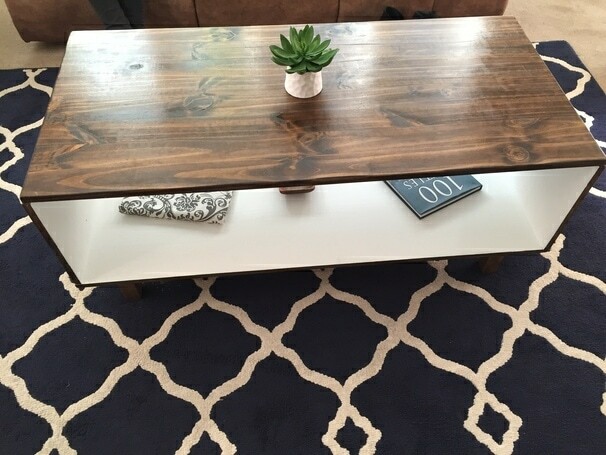 This project can be found on RYOBI Nation. Sometimes you won’t have an extra hand around to help you carry snacks and drinks (because everyone will be too busy socializing), so you’ll need some sort of drink tray or carrier. You can make this as complex or simple as you want. 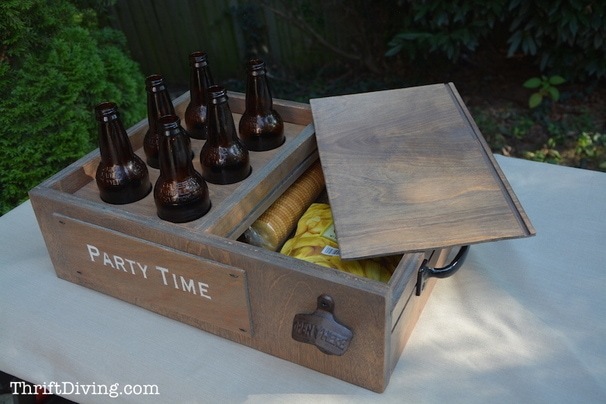 This drink carrier is one that I made for summer gatherings, but it’s still totally relevant for a holiday get-together! 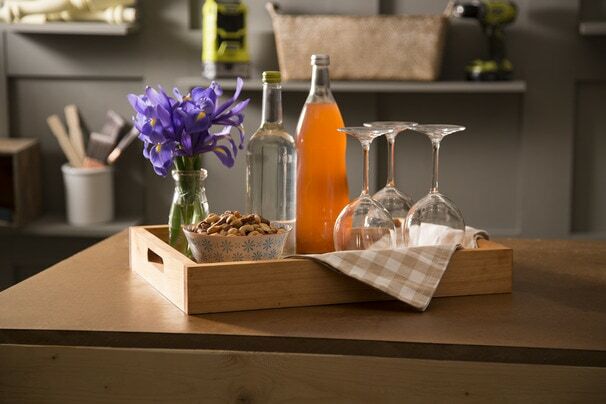 But if you want a drink carrier that’s a little more simple, this wooden one is perfect. You wouldn’t even have to cut handles out. Just use door handles or decorative drawer pulls and screw those on to the side! Must-Make #7: Corn Hole, Anyone?? I know this is generally a summer backyard game but think about those little kiddies coming to your house for your holiday gathering. Why not make a set and decorate it with a holiday theme? It will give the kids at the party something to do in another room while the adults are adulting. See the tutorial pics HERE. When there parties, there is wine. It’s really one of the joys of getting together, isn’t it? I love grabbing a drink with friends and family! This project is super easy (again, with pallets! ), and if you’re having a small gathering, this size would be perfect. You can extend it to accommodate the size if you need more space. 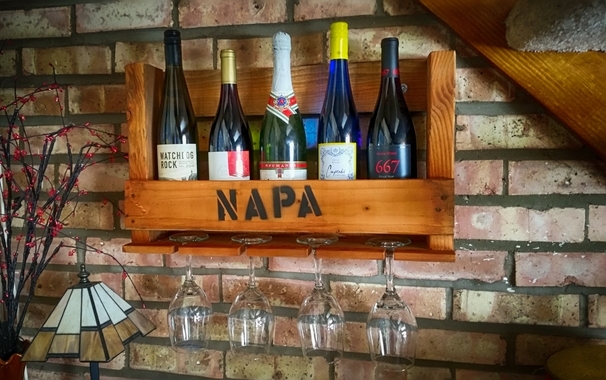 The only thing you’d need to do to create this project is to cut a piece of the pallet off, and attach a piece at the bottom with little notches cut out (use a jigsaw for that) to hold the wine glasses. 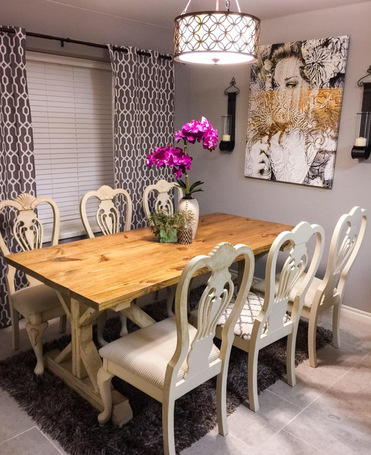 I’ve been ogling these trestle dining tables for awhile, so when I saw this one on RYOBI Nation, I got excited! People need a nice big table to enjoy dinner together during Thanksgiving and other holiday get-togethers, and this is one that isn’t that difficult to make. Not that I’ve never made one before, but it looks pretty simple from the tutorial! Imagine telling everyone you made the table they’re sitting at. Try finding a good set (or go mismatched for a touch of whimsy) at the thrift store and refininsh them to go with your new table. In the center of that awesome new table you just made, don’t forget the centerpiece! 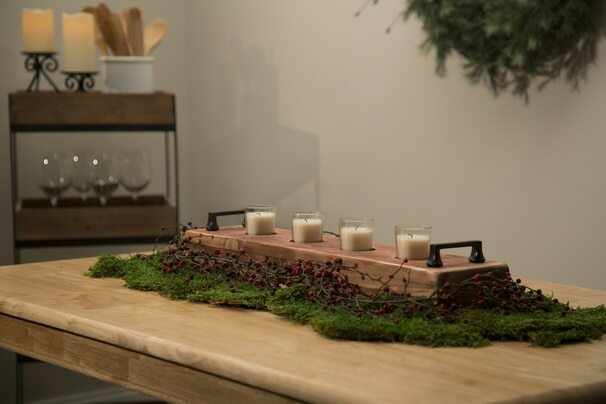 You could even have The Home Depot cut the wood to your size, and then just use a hole saw on your power drill to create the little circles to hold the candles! Add handles to the top, and spruce it up with decorations around it and–VOILA!–a cozy place to eat and talk! This is one of the benefits of partnering with RYOBI tools! I get to give away a lot of free tools, which is awesome for you, and good for them to get out the word that RYOBI rocks! There are lots of ways to get additional entries, but it’s not required to do all of them! That depends on how many entries you want to get. Giveaway runs Nov. 1 – Nov. 30th, at 11:59 p.m. Winner must have a U.S. mailing address and will be chosen at random and notified by email on or near Dec. 1, 2016. So many great ideas, thanks for sharing………….I love the trees and who knew I could make my own trestle table! Ooooh Serena!!!! Can I hug you!!! These are marvelous ideas and yet so simple and homey!! love it and thanks so much for sharing your unique tips and ideas! !